A special Choral Evensong on Sunday, 22 September 1913, marked 100 years since St Matthew’s moved from the corner of Queen Street and Church Street, to its present site. The second St Matthew’s church, dedicated on St Matthew’s Day, 1913, was damaged and subsequently demolished following the 1942 Wairarapa earthquake. The present church was dedicated in April 1958. The Order of Service included most of the hymns, psalms, canticles and readings used at the Service of Dedication of the Second St Matthew’s Church in 1913. Clergy Ted Dashfield and Stephen Kimberley discuss last-minute details before the service. Clergy enjoying a good sing during one of the hymns. April Bamford leads the intercession. The Reverend Ted Dashfield thanks the choir. Evensong Choir on the chancel steps. 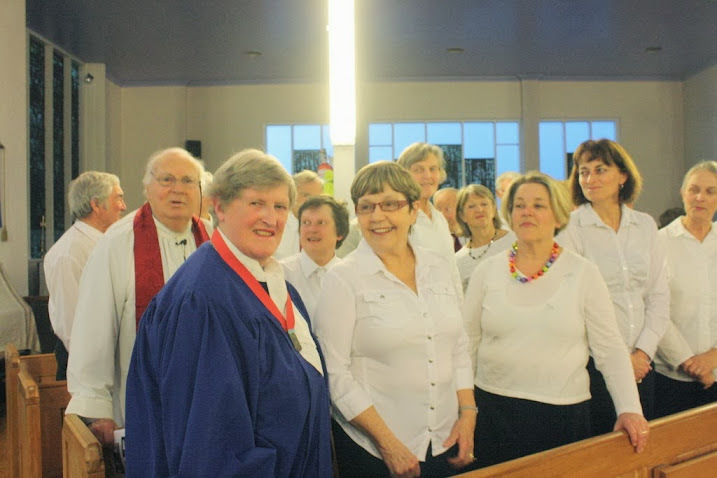 Hilda Payne, the Reverend Ted Dashfield and Barbara Anderson lined up with the choir for a photo. The Order of Service for the Evensong on 22 September 2013 is available here (pdf). Overview of history of St Matthew’s Church is available here.